BERLIN in 3D, Virtual Worlds and Web 3D News: Do you like to translate ? Do you like to translate ? 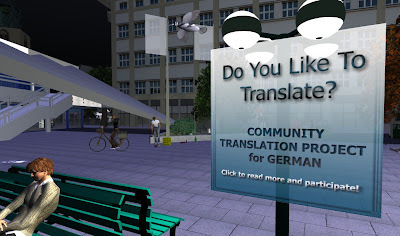 Our virtual City newBERLIN is a ideal place in Second Life® to meet people especially from Germany . That´s why Lexie Linden asked us some days ago, if we might hang up some of her adverts in our City. What is it about!? The Lindens are looking for people who might translate content of the Second Life Wiki, e.g. the Knowledge Base, into german. We login 2 life ! !